"Unless you hate animals, you'll love this book." Truer words could not have been spoken in reference to the tbp WE3. 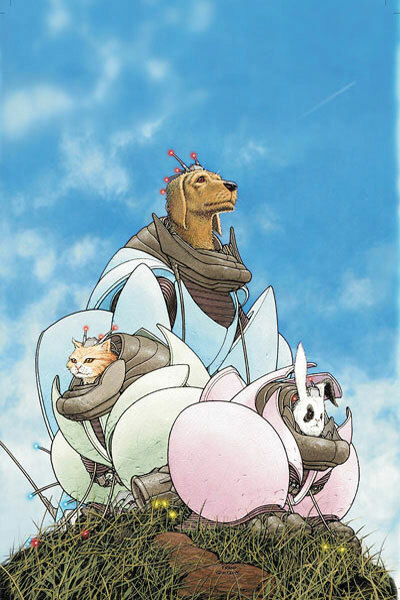 Grant Morrison and Frank Quitely's tale of three furry killing machines on the run from the government is better than bad, it's gud. The comic of the day presents readers with a "what if" scenario that doesn't seem too far off no matter how cruel it may be. In this adventure of one part dog, one part cat, and one part rabbit, the tech-enhanced animals' emotions and basic needs to be told they are "gud" places this story right up there with all of the other three robotic-suit-wearing animal stories. It sounds funny to say, but Morrison gets inside the heads of the animals to present unique responses based on their type of animal. '1', the dog, acts as the leader. Being as dog's are placed as "man's best friend" we reward them with the leading role. '1' yearns for human affection and to be told he is a "gud dog." He is very protective, like a standard dog, and is also built and armed like a tank...which helps with the whole protection thing. '2', the cat, is your standard cat stereotype: very independent, stealth-like, sassy and fierce when she wants to be. She is the most deadly because of her agility and surprise attack style which catches even the toughest opponents off guard. Some of her kills, in this 3 part tale of survival and safety-seeking, are both brutal and very sleek. All of her kills, but one (you'll know it when you read it), are enjoyable. She has a problem with authority and does not like to take orders from '1'. Cats and dogs don't always get along, but once in a while, when they team up, they can make the best of partners. Rounding out the trio is the mine expert '3' a little rabbit. '3' is a jumpy nervous team player. '3' takes orders from '1', but is always sure to see what Ms. Kitty's move will be, as well. '3' is a sad story which readers will appreciate and even let out a "f*** yeah!" during his shining moment. Slow and steady may win the race, but rabbits are always cool no matter the outcome. Besides some million panel story telling style in the first chapter of WE3, Grant Morrison and Frank Quitely put together an action packed gripping adventure. Quitely's art shines when it comes to '2' and '3', but his dog pencils at time look out right grotesque. Though that may be the direction aimed for at times, it still felt a little out of place when compared to the softness of the rabbit and cat. This Homeward Bound meets Short Circuit meets RoboCop animal adventure is a fast pace thrill. "Unless you hate animals, you'll love this book."